One of Deb's new Wacky Whiskers. Lucy is one of Deb & Glenn's six rescue kitties. Lucy is a grey and white dilute calico. Of the six rescue kitties, Lucy is definately the sassiest! Lucy and Ethel are litter mates. 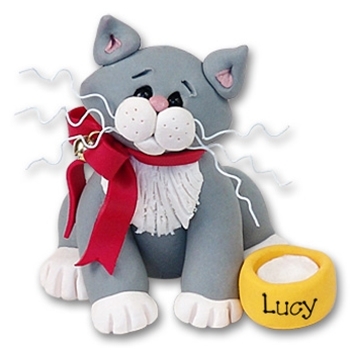 Lucy may be easily personalized with a name on her food or cream bowl. Handmade from polymer clay and designed by Debi Allison. She is packaged in her own little clear acrylic box with a cute background that may also be personalized.